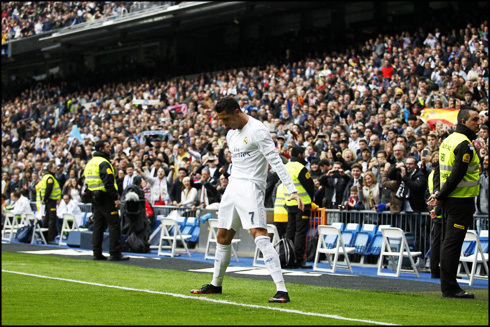 ﻿ Real Madrid 4-2 Athletic Bilbao. Ronaldo keeps Madrid flying high! 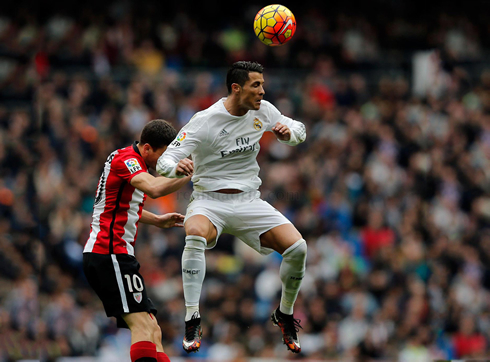 13.02.2016 » Real Madrid 4-2 Athletic Bilbao. Ronaldo keeps Madrid flying high! It may still be a long shot for Madrid to win La Liga this season, but the Merengues seem to be determined in fighting until it's mathematically impossible. Zidane's men grabbed the 3 points at the Bernabéu, after beating a valiant Athletic Bilbao in a 4-2 win. 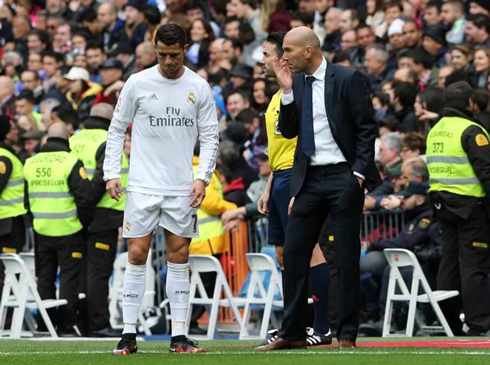 Real Madrid kept their perfect record at home since Zinedine Zidane took charge, as they went on to beat Athletic Bilbao by 4-2, in a very interesting game at the Bernabéu. Under Zidane's orders, the Merengues have now won all the 4 games played at home and already scored a total of 20 goals. This Saturday their last victim was precisely Athletic, who despite their bravery and gallantry on the pitch, simply couldn't handle Real Madrid's attacking firepower. Cristiano Ronaldo added another 2 goals to his individual tally to overcome Barcelona's Luis Suárez on the top of the Pichichi standings, while James Rodríguez and Toni Kroos both scored a goal each to help securing the 3 points. Next week there's the Champions League return, with a trip to Italy to face AS Roma on the last-16 first leg. Real Madrid's defense may still need a lot of work and it wasn't the most perfect performance, but a brace from Cristiano Ronaldo was enough to help the hosts to achieve a 4-2 victory over 6th placed Athletic Club Bilbao at the Santiago Bernabéu. 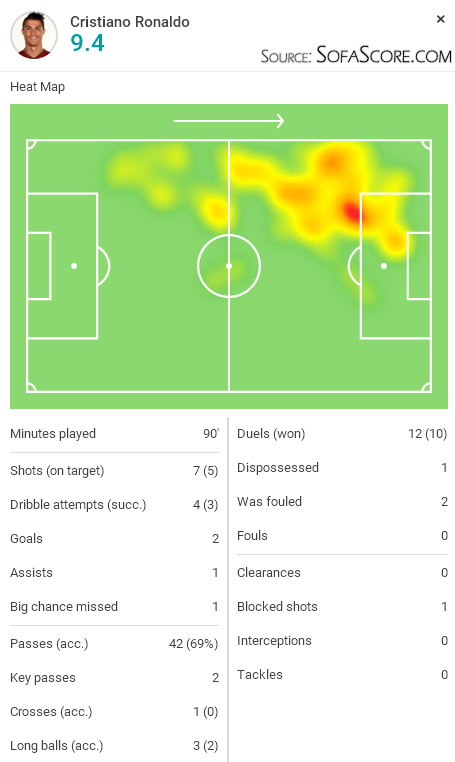 James Rodríguez and Toni Kroos made it to the scoresheet as well (a rare strike from the German midfielder), but the story of the day was mostly about Ronaldo, who shut up the critics today with his two goals, his assist and his overall play. The Merengues got off to the best start possible, seemingly a new feature of their game under Zidane, when Cristiano Ronaldo scored an early wonder goal. In essence, it was class CR7 running in from the left, cutting in, bamboozling the defender and then placing the ball into the top corner of the net. But these moments have been a bit rarer this season, so when they do occur they mean so much. 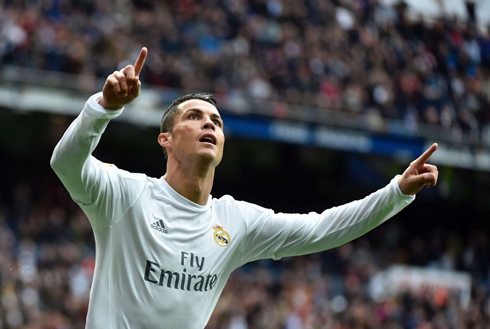 The finish itself was sublime, as Ronaldo opted for finesse over power, curling his shot into the top of the net. It was 1-0 on the scoreboard just after only 3 minutes. However, Real Madrid would gift Athletic an equalizer not long after, through some dreadful decision making from Raphael Varane. Miscommunication between the Frenchman and Keylor Navas led to an easy goal for Javier Eraso, allowing the visitors to draw things level at 1-1. For the next twenty or so minutes, the matchup would be filled with end-to-end action, with both teams looking to go ahead and chances being created at either end. 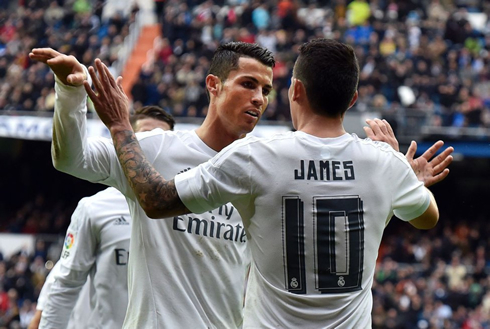 Real Madrid would edge in front however, thanks to a massive strike from outside the box by James Rodriguez. Madrid would notch a third right before the end of the half, this time being Toni Kroos scoring following some nice interplay between him and Ronaldo. The second half would see both sides play a more pragmatic game. Varane was eventually sent off for his second offense, but thankfully a second strike from Ronaldo, this one after some great control and composure in the box, finished off the match. Bilbao would score again late, but the match was already out of reach as Madrid recorded yet another home win under Zidane. Real Madrid now sit only one point back of Barcelona, who of course have two games in hand, but positive signs all round heading into the Champions League matchup against AS Roma in midweek. Cristiano Ronaldo next game will be for Real Madrid in the UEFA Champions League on the 17th of February of 2016, against AS Roma. You can watch Juventus live stream, AS Roma vs Real Madrid, Barcelona vs Celta de Vigo, Manchester City vs Tottenham, Arsenal vs Leicester City, and Aston Villa vs Liverpool, all matches provided from our soccer and live football game pages.